Julie is an Assistant Professor of Biology at Missouri Western State University where she teaches ornithology and animal behavior. On campus she is active in the banding lab and is establishing an extensive network of nest boxes to research avian reproduction and behavior with talented undergraduates. 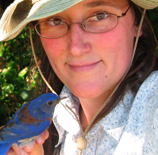 In the lab she has developed molecular scatology techniques that uncover the arthropod diets of insectivorous birds, helping to connect ecosystem services to avian foraging.